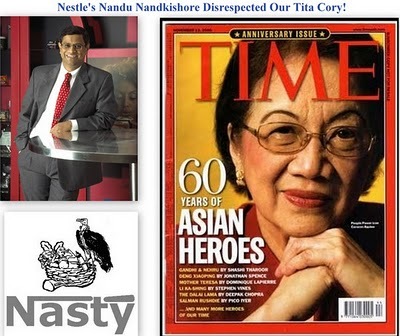 "Nandu Nandkishore: The Nestle Executive Who Disrespected Cory Aquino!" Full and original article appears here. Frits van Dijk, head of Nestle’s business in Asia, Oceania, Africa and the Middle East, will retire in September. Nandu Nandkishore, who became head of Nestle’s nutrition unit last year, will replace him. We do not believe that it is morally acceptable for Nestle to promote senior executives even if they cheat during their overseas assignments, deceive and cover-up serious misdeeds, treating shareholders and the public as gullible fools. Are cherished Nestle values not important anymore? Are controversial executives just "kicked upstairs" in Nestle? If so, this would be a great insult to all the honest and competent executives in Nestle worldwide! Some companies are not content with just being monopolies. They have to be bullies and hypocrites. Alas, their behavior is the exact opposite. A curious case involves one distributor who discovered a sexual affair between their top officer and the sales manager in charge of their account. Instead of addressing the blatant conflict of interest, guess what the multinational did when this was brought to the officers’ attention? They illegally terminated the distributor’s contract, and threatened him so he would remain silent. Several months ago, I wrote about this food multinational corporation that was bullying one of its Filipino distributors. Considered the world’s largest food and drink company, this multinational had terminated its contract with a distributor and had threatened to do the same with another distributor. The reason stated was conflict of interest. The alleged conflict of interest was based on Distributor 1’s shareholders’ discovery that one of its executives, a married man, was having an affair with a sales executive of the multinational. The relationship led to double the amount of discounts on the multinational’s goods given to retailers (such as groceries) by the executive. This led to brisk sales, but at a loss to the distributor. The multinational made money all right because it sold its brands, and their executive got recognition and financial incentives because of her performance. However, all these were at the distributor’s expense. Even more disturbing, an independent audit showed that there were “phantom deliveries” of products to the distributor, non-existent goods, but still paid for because of the connivance between the parties to the illicit affair. Well, sanctions were applied all right, but to the wrong party—my gulay, to the distributor! Eventually, the multinational had a dialog with the distributor to settle their differences. Nothing came out of it. As it turned out, this was not an isolated case. Another sales employee of the multinational coerced five Filipino distributors of the company in Central Luzon to pass on goods to Metro Manila wholesalers at 8 to 10 percent discount. Manila distributors like Distributor 2 could not compete with such low prices, but because the multinational forced it to “hit targets at all costs,” it had no choice. In the process, it lost money. My gulay, the distributors later found out that the customer offering preferential discounts was the executive’s husband. They discovered this when the checks they were given by the customer bounced. Upon investigation, the checks were traced to the executive’s account. And the distributors were not the only ones left holding the bag. Just when the couple’s scam was discovered, the executive’s husband got cash advances from the Metro Manila wholesalers for goods they never got. One of them even lost P22 million. What do you do with a bully who runs roughshod over its distributors? You take him to court! It's worth a try because the amalgamation doesn't irritate the skin. skin and promise to be less irritating. Just check customer reviews before heading buying off there. used to make sure that pregnancy won't occur during treatment. The older we are the harder it is to lose this stored fat. dumbbells, swiss balls, medicine balls, and more' watch for it in coming months. Thus, consuming a wholesome balanced diet rich in proteins and low in fat accompanied by a moderate exercise schedule is a wholesome technique to aid the fats burning in the body. Very similar to the sites listed above, but you can also make your own fitness routine. It depends on who you request, but quite a few pearl professionals currently agree that freshwater cultured pearls can rival the attractiveness of their saltwater cousins. Now Titanium is made into wonderful rings for women as well. Native American bracelet that suit your taste. Many people prefer diamonds in their jewelry when a gift is being purchased or gifted. necklaces, designers are fond of enormous finger rings with big faceted gemstones this summer season. your acne problem becomes the one which doesn't inflame itself further to the future. Did you will know lavender essential oil contains antibacterial elements. Sometimes you may should test products for two to 3 weeks to actually know if it is going to become beneficial or not. Many traditional hair products including mousse and hair spray are certainly not 100 percent safe, this also can have an affect on your own health along with the environment. Nestle Centennial - is it worth celebrating? EQ: Nestle - "DO YOU PLAY BY THE RULES?"